Destined for so much, achieving so little: Body Shop Rediscovery! One of the things my hubby remembers about me from when we first started dating is that I always smelt delicious, like mango and papaya. It was of course the famous body shop body butter! I've tried other brands over the years from boots and superdrug but had kinda fallen out of love with body butter and was left feeling uninspired! 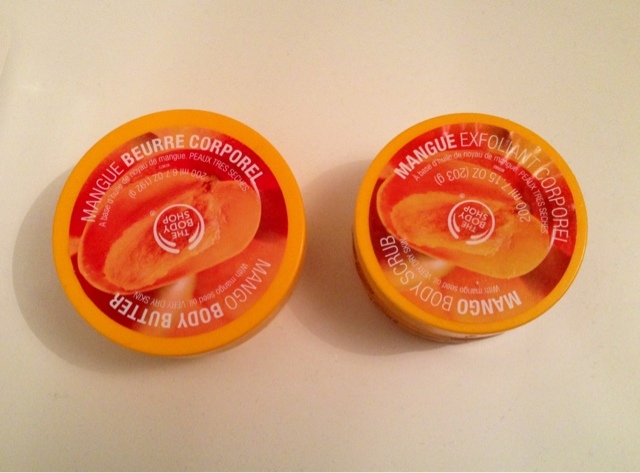 However for Christmas my hubby bought me a brand new pot of mango body butter along with the exfoliating scrub. What a match made in heaven it is! I'd always used the body butter but had never thought to try the scrub - what was I thinking??!! The emollient and cleansing nature of the scrub makes your skin silky smooth and soft like a cherub. Followed by a layer of body butter and you are left with truly divine skin which retains its heavenly smell for hours - I've even caught my hubby taking a quick sniff of the back of my neck when he thinks I wont notice! Have you rediscovered anything lately?